Let’s be clear – I am not a vegan. There is very little to nothing that I will not try, let alone devour if it tastes great. In New England, farm-to-table from regional farming providers that are delivering rare finds is becoming proliferated. On a recent trip to Maine we stumbled upon an all-vegan farm-to-table restaurant with much delight. I was wonderfully impressed with what was both simple and jaw dropping delicious. Often do I take those delicious experiences and return back to my science lab, I mean kitchen, and endeavor to reverse engineer each layer. 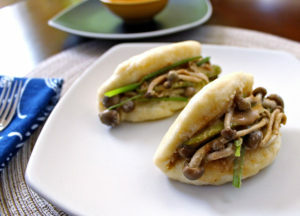 The dish in this experiment was smoked mushrooms in an open bao bun with an out-of-this-world cashew sauce. Making these bao buns was fun and simple. They offered a silky pillow to carry the mushrooms, and the cashew hoisin sauce was so good you simply couldn’t put the bun down after that first bite. However, the delicately smoked mushrooms were the secret ingredient in this dish. Simple, light, and with gentle hints of cherry wood smoke enveloping the entire bun, made this recipe delectable and unique. For the record – this is not a vegan recipe, but the essence of freshness and simple vegetable ingredients delivers a real treat. In a stand mixer with a bread hook attachment, combine the flour, powdered sugar, baking powder, salt, oil, and lime juice. With mixer on low, add milk slowly and mix until all the ingredients come together forming smooth dough, about 10 minutes. Use a rubber spatula to scrape sides as necessary. Let the dough rest for 30 minutes. Turn dough out onto a flat surface and knead dough to compress. Roll dough into an even log, then cut one inch slices. Using your hands, compress slices and roll into even balls. With the palm of your hand, compress each ball into a flat disk, and fold in half gently. Transfer buns to baking sheet lined with parchment, cover with cling film and let sit for 1 hour. Add vinegar to water of the steamer, and bring to a boil. Place buns into the steamer, and cover (do not over crowd as buns will expand). Place cashews in a bowl. Cover with water and soak for 3 hours. Drain and rinse thoroughly. Place soaked cashews in a food processor with the stock, garlic, and salt. Puree until very, very smooth. In a bowl, season mushrooms with a drizzle of oil, and sprinkle of garlic and onion powders, and pinch of salt and pepper. Toss to coat. In a stovetop smoker over medium heat, heat fine wood chips, preferable fruit tree wood). Add mushrooms to smoker grate. As soon as it begins to smoke, close lid and smoke for 15 minutes. Remove from heat. Toss smoked mushrooms in sauce. Assemble buns with helping of mushrooms, scallions and pickles. This entry was posted in Appetizers, Cooking, Main Dishes and tagged Vegetables, Vegetarian by cfaust. Bookmark the permalink.